Mask out tape will blend in with Kraft corrugated box. Our Kraft colored flatback paper tape has a very aggressive permanent adhesive. 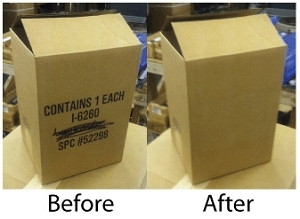 Covers unwanted markings on corrugated boxes instantly. Permanent adhesive stays on corrugated and very difficult to remove without taking the corrugated surface off as well. 4 stock sizes to choose from. FOB FACTORY, allow 2 days to ship. 2X3" Kraft mask out label. Minimum order 2 rolls.